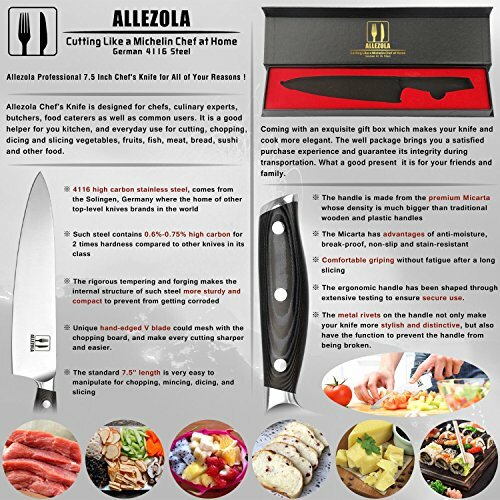 The Allezola 7.5-inch knife is designed for professionals who include chefs, culinary experts, food caterers as well as an ordinary person. 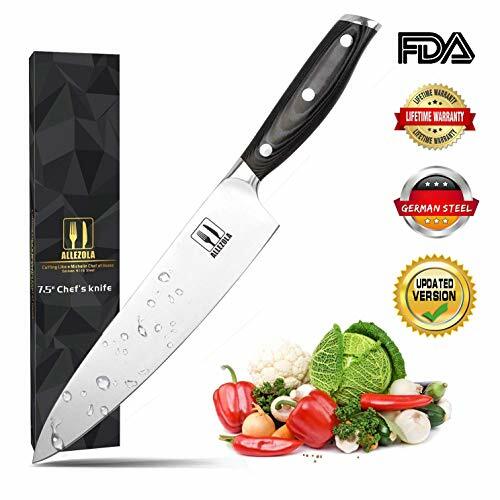 It is a multipurpose knife that is ideal for various tasks which include cutting, chopping, dicing and slicing vegetables, fruits, fish, meat and other products. It is also ideal for removing flesh from bones as well as pounding /smashing garlic. 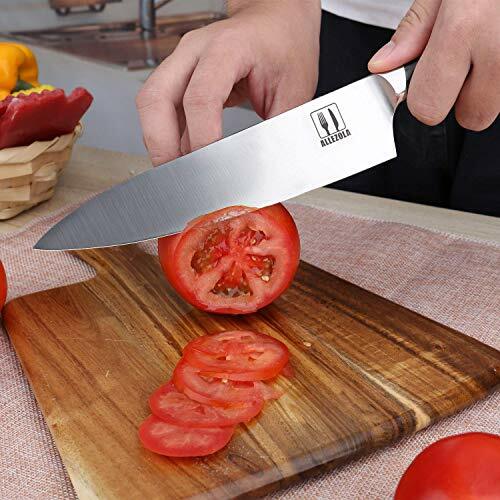 The knife is crafted using Germany engineering and features a toughened stainless steel blade that measures 7.5-inches. This 2.35-mm thick blade consists of approximately 0.6%-0.75% carbon for added strength and durability. 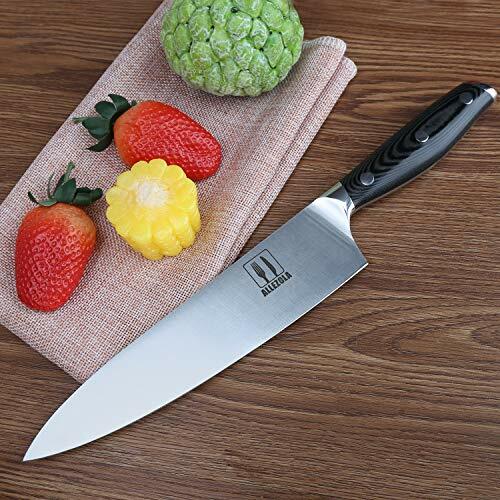 The length of the handle is 4.5 inches giving the knife an overall length of 12.5 inches. To ensure the knife is resistant against rust/corrosion and won't rust, the steel blade also consists of 16-18% chrome material. The weight and size of the knife feels quite balanced and a user won't feel bogged down because of its weight. It also has good ergonomics that minimize the possibility of experiencing aches and cramps on the finger especially after long use. 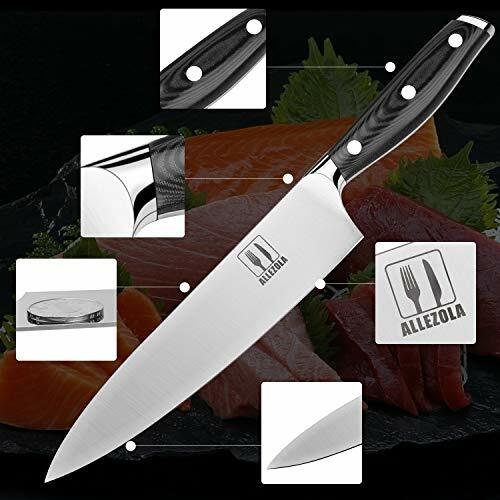 The combination of German technology and quality materials lead to a high-quality and reliable knife for varied uses. This is further boosted by the Micarta handle which is very comfortable and doesn't slip easily. For the long lifespan of your chef's knife, please wipe it with clean towel or put it in a dry place after every use to avoid getting rusty. 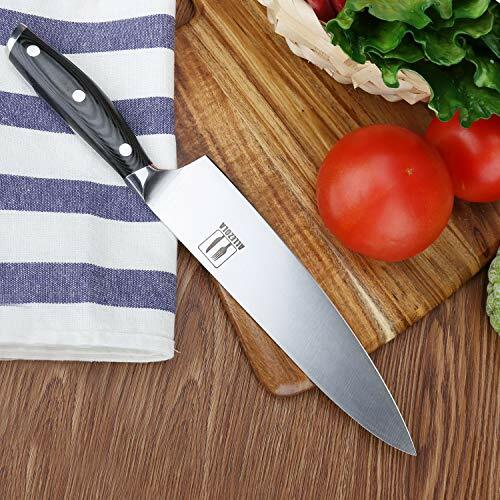 High-Carbon Stainless Steel Blade: Made of German 1:4116 steel, which comes from Solingen, Germany, With 0.6%-0.75% carbon, rust resistant and much harder than normal knife, only include 0.3% carbon from lts raw material. Multi-Functional & Extra-Sharp: Designed for chopping, mincing, slicing and dicing with a razor-sharp, laser-tested tapered edge ground, accurate angle to ensure maximum cutting performance and long-lasting durability. Durable & Ergonomic MICARTA Handle: Micarta material, known for it's comfort, strength and stability. 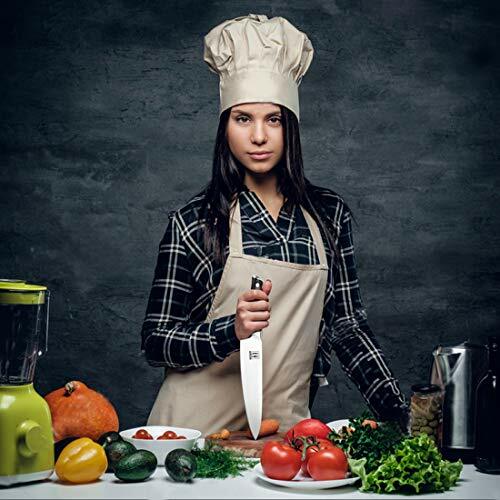 Ergonomic handle can minimize any fatigue, finger numbness or aches after holding knife for a long time, great ideal for people who cooks frequently. Size & Weight: standard 7.5" length, very easy to manipulate for chopping, mincing, dicing, and slicing. A weight of 6.7 oz (189.9g), providing great balance, most suitable for giving greater control of cutting. Lifetime guarantee & Elegant packing: Our Lifetime Warranty and No Questions Asked Return Policy take the risk out of your purchasing decision. (Note: pls dry it timely with towel after use or rinse for long lifespan). If you have any questions about this product by Allezola, contact us by completing and submitting the form below. If you are looking for a specif part number, please include it with your message.